The Prime Minister announced other emergency measures to deal with panic fuel buying and possible petrol shortages by declaring he would be photographed playing a game of rounders against a team picked by the Chancellor George Osborne in Downing Street outside their respective front doors tomorrow as well as a game of five-a-side against the Liberal Democrats in the park round the corner on Saturday. 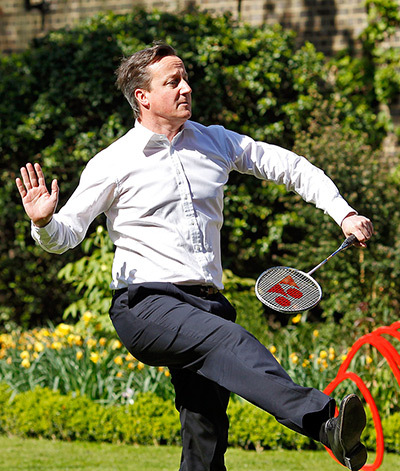 This is a real photo from Cameron’s press conference in the Rose Garden today. Erm – he needs a press officer really badly, doesn’t he? How on earth did DC, let alone a press officer, let that photo through?? Yeah – great isn’t it? Oh yes – good point. Doubles tennis? They might be able to stretch to two after the next election. If they’re lucky.